Translation:Do you see a boy? "chłopiec" is the Nominative (dictionary form) form of "boy", "chłopcy" is plural Nominative. "widzieć" (to see) takes Accusative, which for singular is "chłopca" (and for plural: "chłopców"). Thanks a lot for this input, but I was wondering, I usually referenced myself to the Wikipedia table of the cases, and they don't really indicate these endings, would you (or anybody else really) know of a complete table that includes all of the endings for all cases and genders ? So the -a ending is the accusative of a person m? Accusative is the only case where it's important whether a masculine noun is animate or inanimate. "chłopiec" is animate, so the Accusative form will be identical to Genitive form. And yes, it mostly ends with -a. We don't know the context of the sentence. But I think the boy is likely to be particular ("the boy"), not any ("a boy"). Is it possible to translate this as "the boy"? Is "Do you see this boy" ok? In Polish is there a difference between the that and this? We do not have the, this= ten, ta,to is sometimes translated to the, also much more often used than that=tamten, tamta, tamto which is used only when referring to the other thing. Also to=this/that is used when separate, or as replacement to is and the gendered versions are used when they are before noun and easily translate to the. But I think duo accepts both omitting the or translating it to ten/ta/to, but not adding "this" where there is no "to" in Polish. 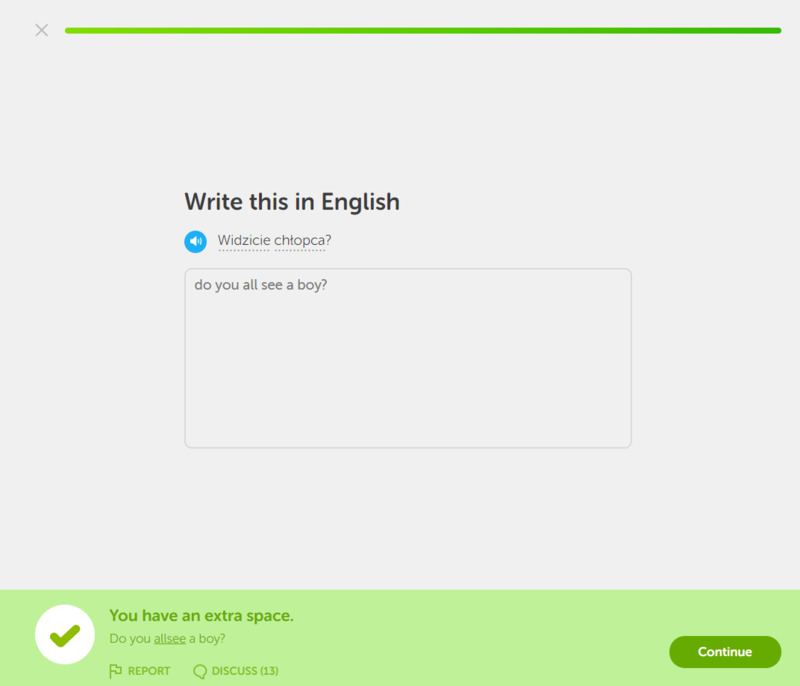 how can chłopca equal boys and boy? Not "boys", plural, but "boy's", the possessive form of "boy". The Accusative and Genitive forms of "chłopiec" look the same, so the hints need to include the option for the possessive use of the Genitive form. There is an error on the green strip at the bottom. It thinks I have an extra space when the correction is actually incorrect. You're right, fixed now. Thanks! I'll give you a tip: you can better learn Polish if you'll learn Ukrainian. They are very simmilar.